A Subtle Grace on Kindle: Ellen Gable‘s latest historical romance is now available on Kindle! I was privileged to read a draft in earlier stages, and I am confident in saying that the final version (available now on Kindle, in print in a few weeks) is a rip-roaring, tug-at-your-heart, whitewater rapid ride through the life and heartbreaking misadventures of Kat O’Donovan. I have a review copy waiting for me, so I’ll leave you with that. Can you bully a celebrity? I realize all the hubbubb has long since died down over John Travolta’s gaffe at the Oscar’s over the pronunciation of Idina Menzel’s name. However, this has been weighing heavily on my heart, so I’m going to put it out there. It’s topical to this blog, as Don’t You Forget About Me deals with the topic of the scars left by bullying. Cryptography & Charlotte Mason: We are so close to the end of our homeschooling year that I can taste the salt breeze of our first day on the beach while other kids are still in school. The problem is that we are running out of steam, and when that happens, the first thing to suffer is math. We use a rigorous math curriculum that is pretty much the only thing that sticks out of our Charlotte Masoning like a sore thumb. After talking to some other homeschooling moms yesterday at our one club’s annual speech party, I’ve come to realize that my kids just don’t care about math, and that’s got nothing to do with them. It has everything to do with the fact that I’ve spent 10 years telling them to ask “why” about everything but never giving them an opportunity to ask “why do we need to know this math thing here?” So I’m aiming toward taking a break and doing more real-life math. Today we’re going to start making tiered skirts from ripped jeans, and First Shift of Kids (10yrs) will be doing all the calculating of fabric needs and costs. After that I want to introduce them to some practical cryptography (aka leaving your sister notes that your mom probably can’t read). We already read plenty of books in which characters know how to sew. Can anyone recommend any books where kids use cryptography? KIDS, people. The first person to recommend Cryptonomicon for my tweens will get a smack upside the head. Lenten Anemia: Speaking of failure, ever since Lent started, I have found myself more exhausted than I’ve ever been, and I’ve been suffering fatigue off-and-mostly-on since 1989. At first I thought it was a bit of seasonal affect disorder that would disappear once the snow pulled back some. It’s even gotten to the point that–GASP!–I’m thinking about going to the doctor, which life has since taught me that going to the doctor with a complaint of “fatigue” is just about always a fatiguing waste of time. Then I was talking to another mom who happens to be a nurse, and she suggested I ask specifically about anemia. Duh. It started right when I dropped meat all but out of my diet. Crud. So. Pray for me as I see what happens by adding more leafy greens and what beans I can tolerate into my diet. Money is tight. 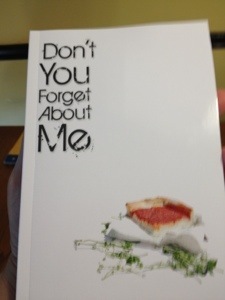 Please buy a copy of Don’t You Forget About Me. Already did? Please leave a review encouraging others to buy it. 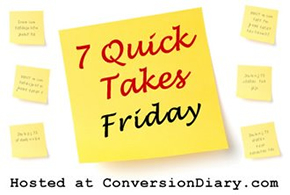 Stopping over from Conversion Diary. Those ruffle skirts are adorable. I am not a math fan, so when my girls are old enough for homeschooling, I think we will be going for lots of “real life” math. Best of luck. Thanks! Ours will be longer than the skirt in the pic, not just for modesty but because that should help them last through at least the next growth spurt. Good wishes on your journey to homeschooling!